Football in Western Pennsylvania is a religion. If you want to witness a ghost town, take a ride through a small town in Western Pennsylvania on a Friday evening. You’ll hear it: Deafening silence. In the distance, however, you will see bright lights and hear loud cheers, music from a marching band, and the cracking of the shoulder pads. As I sit here and write this I am getting chills. I have an overwhelming sense of nostalgia as I recall not only the sights and sounds, but also the smell of the grass field and clicking of spikes on the concrete. These memories are deeply engrained in me and I will never forget those days. I was in love, and still am, with athletics and competition. To this day, competition is what drives me. I have learned a lot from my father throughout my 32 years on this earth. One of the greatest lessons I have learned happened when I was playing high school football. In high school, I literally ate, breathed, and slept athletics, especially football. I was one of those guys who loved every minute of the process. I loved off-season workouts. I loved training camp. I loved practice. To me, games were the culmination of all that hard work. 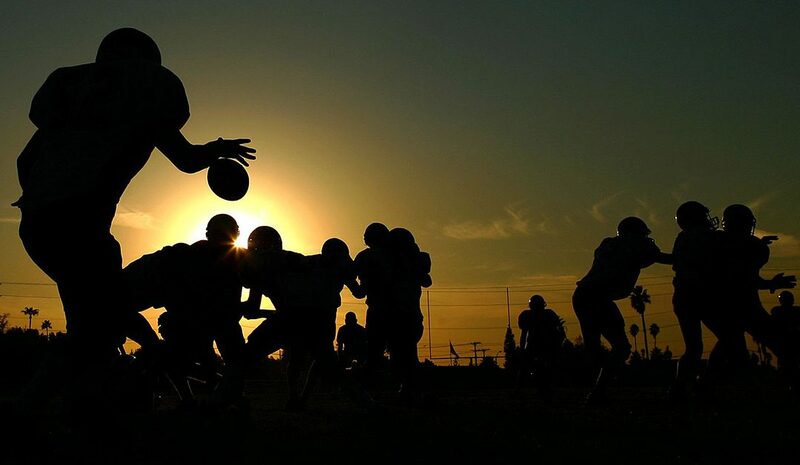 One day, after a bad practice during training camp in high school, my coach, who was also my father, was very upset at the way our team practiced. The lack of effort and disappointment was enough to have him call practice early, which is a nice way of saying he kicked us off the field. I was very upset. As a captain, I started to tear into my teammates. We had some other leaders on the team that shared my frustration. These guys also had some choice words for the guys who were dragging. We headed to the locker room. I quickly showered, packed my things, and headed to the car. I, unlike the rest of my teammates, had to drive home with my father. You know… the guy who just kicked us off the field. There was a customary long silence on our short ride home. Tensions were high. It was almost like a standoff to see who would break first. Who would be the first to complain? The truth was, it was awful and I was beyond frustrated. We were the defending champs, who had our first game in less than 2 weeks, and just had maybe the worst practice ever. Everyone seemed willing to rely on the previous year’s success. I couldn’t understand why the guys didn’t want to work hard. Didn’t they want to be great? If everyone cared as much as I did then we wouldn’t have these problems! I wanted to win. That’s all that mattered. And it seemed like these teammates of mine didn’t care one bit! I’d tell them to focus. I’d tell them what we needed to do. They just didn’t seem to get it. Looking back now, how foolish of me to think leadership was all about telling someone what to do! This was a hard concept to understand. I had never looked at leadership from this perspective. I had to let go of my ego. Of, “Hey, get on the train or get out of the way.” But I’ll tell you what. It was the best piece of advice I have ever been given. In my conversations with leaders around the country, this perspective seems very difficult for them to grasp, too. How easy is it to be stubborn, dig your heels into the ground, and focus on being right? Very easy! As a leader, however, you should want to be impactful and make a difference for the group. That should be your focus. Does it take hard work and intentional focus to implement effective leadership? Yes, of course! But guess what? This leadership stuff isn’t easy. Why else would we be in this constant rat race of chasing it? Leadership has always, and will always, be about the team and the group successes and failures. After all, isn’t this the fun part about the journey? A lot of folks can talk about leadership. But to execute leadership, that’s the true challenge. Tyler your father is not only a great coach but also a wise man. He gave you outstanding advice and you’ve obviously heeded his advice to get to where you’ve gotten in your career. I haven’t forgotten about you but we have a health crisis going on in our family that started in January so I’ve been very preoccupied. Let’s try and have a cup of coffee sometime soon and I’ll bring you up to speed on things. Thanks Tyler.